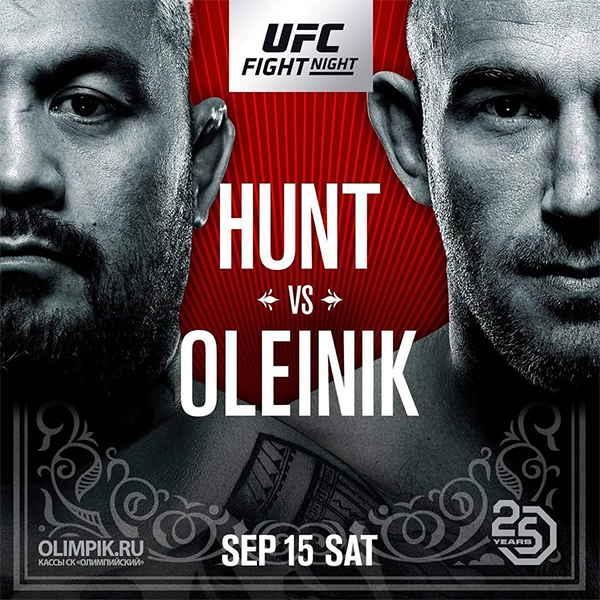 UFC Fight Night 136: Hunt vs. Oliynyk is an upcoming mixed martial arts event produced by the Ultimate Fighting Championship that will be held on September 15, 2018 at Olimpiyskiy Stadium in Moscow, Russia. The event will mark the promotion's first visit to Russia. The UFC has arranged to use half of the venue and will be using a modified seating configuration (17,000 seats) for the arena. While not officially announced, the promotion was initially targeting a heavyweight bout between former UFC Heavyweight Champion Fabrício Werdum and Oleksiy Oliynyk to serve as the main event. However on May 22, Werdum was flagged for a potential USADA doping violation and his status moving forward became unknown. On July 19, the promotion announced that a bout between the 2001 K-1 World Grand Prix winner and former interim title challenger Mark Hunt and Oliynyk will serve as the event headliner. Rustam Khabilov was expected to face Kajan Johnson at UFC Fight Night: Werdum vs. Volkov. However, Khabilov pulled out of the fight citing an injury and the bout was scrapped. The pairing was rescheduled for this event. Douglas Silva de Andrade was briefly scheduled to face Petr Yan at the event. However, Andrade pulled out of the fight on August 9 citing a foot injury. He was replaced by promotional newcomer Jin Soo Son. Krzysztof Jotko was expected to face promotional newcomer Adam Yandiev at the event. However, Jotko pulled out of the fight on August 16 citing injury and was replaced by Jordan Johnson. A lightweight bout between Desmond Green and Mairbek Taisumov was scheduled for this event. However, the status of the pairing is unknown after Green sustained minor injuries in a serious car accident in Davie, Florida on August 18 which left two people dead. Cláudio Silva was scheduled to face Ramazan Emeev at the event. However, Silva pulled out of the fight in early-September citing a lower back injury. Emeev will now face promotional newcomer Stefan Sekulić. Omari Akhmedov was expected to face C.B. Dollaway at the event. 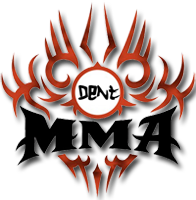 However, Akhmedov pulled out of the fight in early September and was briefly replaced by promotional newcomer Artem Frolov. However, after just three days, Frolov backed out of the fight citing lingering injuries. He was replaced by promotional newcomer Khalid Murtazaliev. Or maybe you mean bigger in the sense of more known fighters.